BEE POLLEN - (Apis mellifica )Plant sperm from male portion of flowers, collected by choosey female experts known as bees. Promotes longevity, quick energy, stabilizes and corrects low blood sugar, contains all the elements for new life such as genetic materials named R.N.A. and D.N.A., rejuvenating, excellent antibiotic, and can be used for internal and external dressings of wounds. * If painful sore throat, soak cheese cloth or absorbent gauze with Bee Pollen Extract and wrap around throat, cover with plastic wrap and a final layer of cloth on top of this to hold all in place. Change morning and night. Repeat until well. * To restore the stamina of youth even under severe stress, 1 - 3 Tbl. per day. Start with 1 Tbl. per day. Persist even if it takes months. * There is a "nasty rumor" going around, which says a man with a vacuum cleaner can collect pollen from flowers cleaner and riper than choosy female bees. The rumor also states that Bee Pollen is hard to digest. In an extract form, however, the contents of the pollen grains have been removed and are free of the cellulose (wooden) pollen husks. This makes the Bee Pollen Extract very digestible. The proof of this is that Bee Pollen extract works and it works beautifully. I sincerely hope that you will squelch this "nasty rumor" about Bee Pollen extract and bees when you hear it. Leave it to the bees, the real specialists! 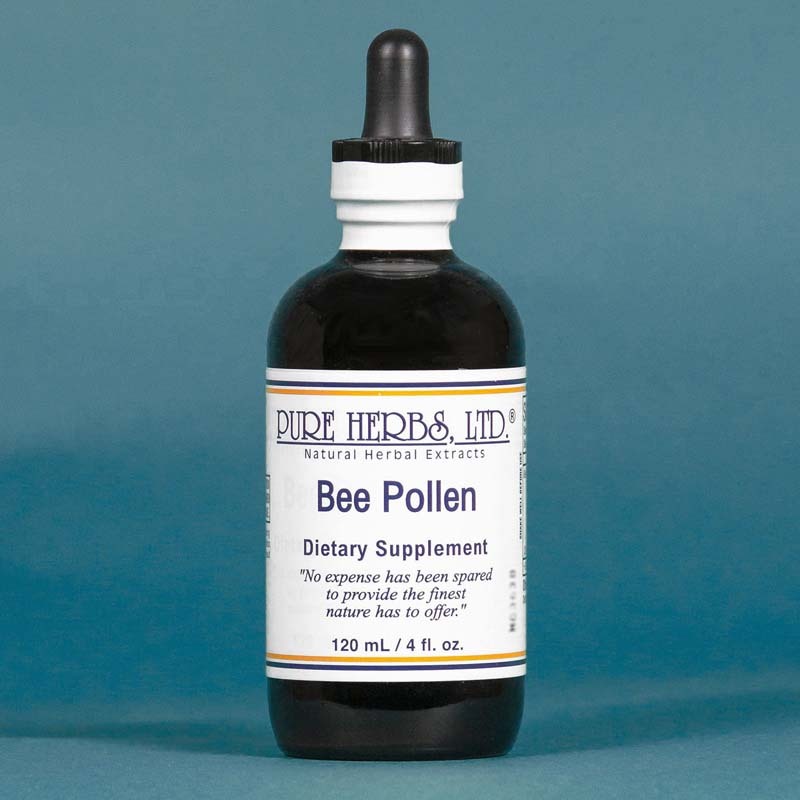 Bee Pollen extract from ripe selected pollen is so good that it is used to counteract allergies even those caused by wild, unripe, air-born pollen. * DOSE:10 to 40 drops once a day for energy or as desired. 40 to 80 drops per meal as a correction and prevention for allergies. For rejuvenation, longevity, rebuilding stamina and for all other internal uses 1 tsp. to 1 Tbl. 3 times per day.